Soap – carries a health warning! You might think that Soap, one of the most widely used and recommended things to keep you safe at home, would be safe to use. Sadly due to modern developments in terms of chemicals, the old favourite soap is now worthy of carrying it’s own health warning. So why has it become so much of a threat? As we have seen in our consumer driven society we want, or so we are told, products that feel nicer, foam better, smell nicer etc and sadly simple old fashioned soap is one of the casualties. The reason chemicals are added to soap is to make them perform better, to have a longer lasting creamier lather that feels nice. Sadly the main chemical added is called Sodium Lauryl Sulfate (SLS) and its close relative Sodium Laureth Sulfate (SLES) both are very effective surfactants and foaming agents but they are derived from Sulphuric acid and often contain dioxane a known carcinogen. Both irritate the skin and unfortunately are absorbed by the skin and SLES cannot be processed by the liver and hence stays in the body long term. We have seen reports of 80 products that contain sodium lauryl sulphate sometimes in very high concentrations that are described as “highly irritating and dangerous“. The answer is simple – it is cheap. The sodium lauryl sulfate found in our soaps is exactly the same as you would find in a car wash or even a garage, where it is used to degrease car engines. Liquid castile soap is a name used in English-speaking countries for soap made exclusively from vegetable oil (as opposed to animal fat). So is ecosoapia. It has an organic vegan formulation and its great for sensitive skin. Ecosoapia organic liquid castile soap We are pretty sure you won’t find a more feel-good hand and body wash than Ecosoapia organic castile liquid soaps. They won’t strip your skin of moisture, plus they are organic and have the Soil Association seal of approval. Ecosoapia is super organic, smells amazing. Keep green and clean with these soapy treats. They are totally organic, look gorgeous and contain no nasties. Ecosoapia organic castile liquid soap will appeal to ethical beauty junkies. 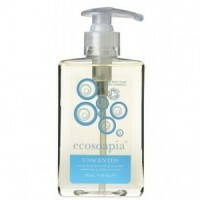 Ecosoapia organic liquid soap comes in cute bottle that fits to every bathroom. Ecosoapia has been awarded both the Chemical Consumer Award and Consumer Award from Allergy UK which is especially important for all those allergy sufferers. I used to be very happy to seek out this web-site.I needed to thanks on your time for this excellent read!! I definitely having fun with every little bit of it and I have you bookmarked to check out new stuff you weblog post. A person necessarily assist to make significantly posts I might state. This is the first time I frequented your website page and thus far? I surprised with the analysis you made to make this actual publish extraordinary. Wonderful activity! This is topical for myclique on LinkedIn-great work! I don’t know about the bullet points.. maybe kinda reaching. I get the feeling that you could be trying to avoid bad feeling with your topic, but please know that the unpopular reasoning can promote healthy debate when argued with respect..and it IS your blog so let your views be King here! It is by reading this article that I am happy to have discovered your ecosoapia soap. Thank you very much! Hello, i think that i saw you visited my website thus i came to ?return the favor?.I’m trying to find things to enhance my site!I suppose its ok to use a few of your ideas!! It’s very trouble-free to find out any matter on web as compared to textbooks, as I found this post at this web site. Previous Previous post: Where does the plastic we use end up?